Tips for setting up an aquarium with live plants – make your fish smile! You’ve seen live plants at the store and you’ve heard that your fish would love to have live plants in their tank, so you decide to give live plants a try. There is one big mistake that most people make when they first decide to start keeping aquatic plants. They go to the store, buy a plant, place it in their aquarium and expect it to thrive, without having done any research about the plant and its needs. You wouldn’t do this when buying a fish, so why would you buy a plant without doing some research first? In this article I’m going to try to present, in as plain of language as possible, what you need to know to successfully keep live aquatic plants in your aquarium. There are two basic types of planted aquariums, Low Light Low Maintenance and High Light High Maintenance. As the names suggest the Low Light aquarium doesn’t require a lot of work but is limited in the plants that you can choose, whereas the High Light aquarium gives you a large selection of plants to choose from but also demands a lot of time and attention. Often a High Light aquarium is going to cost more to set up than a Low Light aquarium. Depending on how willing you are to tackle DIY projects, the cost differences may be minimal. The first decision you need to make is which type of planted aquarium you want to have. This decision can be made by determining how much work you are willing to put into the aquarium, determining how much you are willing to spend setting up the aquarium, or by researching the plants you want to keep and selecting the setup that will allow you to grow the plants you want. 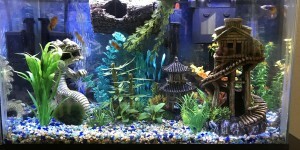 Just like with keeping fish, it is much easier to maintain a larger aquarium than a small one. Starting with at least a 29 Gallon tank will make your first experience much easier. Of course if you want to give yourself a challenge, you could always choose a High Light Nano as your first tank. Maintaining this type of tank is the ultimate in balancing acts. First off, what is substrate? Substrate is whatever you put in the bottom of your tank that your plants will be planted in. It could be gravel, sand, or even a special substrate made for plants. There are two basic types of substrate, those that are nutrient rich and those that aren’t. If you are going to use a substrate that isn’t nutrient rich, like sand or gravel, you will want to supplement it with fertilizers. Plant tabs work great for this. No matter which substrate you choose, you’ll want to aim for approximately 3 inches deep. This is enough to provide plenty of room for the plants to root, but not so much that you risk creating gas pockets that can be dangerous to your fish. When choosing gravel, you want to make sure that it’s smooth and relatively small grained. Gravel that is too rough or sharp can damage your plants and kill them. It is difficult to convince plants to stay planted in gravel that is too large grained. Most aquarium gravel available in the stores will work well. If you choose sand for your substrate, you will want to make sure that it isn’t overly fine and that it isn’t sharp. As with gravel, sand that is to sharp will damage your plants and kill them. If the sand is too fine, it will suffocate the roots again killing the plants. In addition the sand needs to be inert (made of materials that won’t affect your water chemistry). So you will need to avoid the majority of sands manufactured for Marine Aquariums since they buffer the water. You also want to make sure that the sand you select hasn’t been treated with any chemicals that could be dangerous to your fish or plants. This is the main reason you should be careful about using Play Sand. Pool Filter Sand is an excellent option that is inert, untreated, a good grain size and relatively inexpensive. With a sand substrate you will also want to consider obtaining some MTS, Malaysian Trumpet Snails. These snails won’t eat your plants and will burrow in you substrate cleaning and stirring it up. Otherwise you will need to manually stir the sand periodically to avoid compaction and gas pockets. Finally the specialty plant substrates made by manufacturers specifically for planted aquariums. A couple of the currently preferred substrates are Flourite and EcoComplete. The biggest drawback to these substrates is cost. They are nutrient rich and/or good at storing nutrients and slowly releasing them back into the aquarium for the plants to use. If you are going to spend the money on these substrates, make sure use at least 50% when mixing with gravel or sand, otherwise you are negating their benefits and wasting money. There are a few other options that I’m going to address before moving on. As you read up on substrates for the planted aquarium you may hear mention of layered substrates. Usually this involves having one or more nutrient rich materials in layers under gravel or sand. While many have reported success with layered substrates, they are often messy and difficult to prevent the layers from mixing. As you grow more experienced with planted tanks, you may want to give them a try, but for now I would recommend avoiding layered substrates. Not surprisingly many aquarists are working to find inexpensive alternatives to the specialty plant substrates. One alternative that I have read about recently is Turface MVP. Apparently it is used to amend the soil in baseball fields to minimize compaction and promote better drainage. It also happens to be very similar to Flourite at a fraction of the cost. With some research, I’m sure you will be able to find some other alternatives. Unless you are willing to stick with Very Low to Low Light plants, the standard lighting that came with your tank isn’t going to cut it. Even worse, your tank may have come with incandescent lighting. Incandescent light is all but worthless for growing aquatic plants, but don’t throw your incandescent fixture out just yet. You can replace the bulbs in your fixture with screw-in compact fluorescents. These bulbs are self ballasted allowing them to safely be run in your fixture. The U-shaped bulbs are preferred over the spiral-shaped bulbs, but both are a big improvement over incandescent light. These will often give you better lighting than the standard fluorescent fixture for your tank would have provided. So how do you determine how much light you want over your tank? 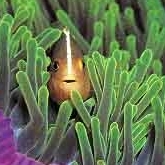 There is a rule for lighting that is very similar to the 1 inch of fish per gallon rule. It’s called the WPG rule, watts per gallon. You divide the total watts over the tank by the number of gallons. The resulting number is used to determine how much light you have. The WPG rule is like the 1 inch of fish per gallon rule, in that it is more of a guide line than a rule and has a lot of exceptions. First off this rule severely breaks down for small tanks, less then 20 gallons, and large tanks, greater than 100 gallons. It is only truly accurate for tanks between 50 and 75 gallons. Plants have minimum and maximum thresholds on how much light they need and can use. As a result very small tanks need more light than the WPG rule indicates and very large tanks need less light than it indicates. In addition the rule was designed around NO Fluorescents (Normal Output Fluorescents) and doesn’t take into account many other types of lighting that are available (Compact Fluorescents, Power Compacts, High Output T5 Fluorescents, and VHO). Very Low Light to Low Medium Light tanks would be classified as Low Light Low Maintenance and Medium High Light to Very High Light tanks would be classified as High Light High Maintenance. Medium Light tanks fall into the grey area between the two types of setup and display some of the characteristics of both. As such they can be difficult tanks to get setup and running well since it can be hard to determine exactly how much maintenance they really need. The final thing to keep in mind about lighting is that not all bulbs are created equal. Surprisingly enough that expensive plant bulb from the LFS (Local Fish Store) may not be any better than the generic daylight bulb bought at the hardware store. It is generally recommended that you buy a bulb with a Kelvin rating between 5000K and 10000K. The Kelvin rating has more to do with how the bulb is going to make the tank look to us than it does with how good of plant growth it will produce. The 5000K bulbs will make the tank look more yellow, while the 10000K bulbs will make it look bluer. What’s important to the plants is that the bulb is Tri-Phosphor or Full Spectrum, which has strong peaks in the red, blue, and green spectrums. If you are lucky the bulb will have the spectral analysis right on the packaging, however, it is often necessary to contact manufacturer. Some of you may be wondering whether or not you can use actinic bulbs over a freshwater planted tank. The answer is yes, however, those bulbs should not be included when calculating the total amount of light over your tank. Some people have reported bushier plant growth when using actinic bulbs and some just like the way it makes the tank look when mixed with the other bulbs. The handy thing about actinic bulbs is that they can be used fine tune the amount of light over your tank. Say a one bulb light fixture doesn’t provide enough light for your plants, but the two bulb light fixture is too much. You can use a combination of a 6700K bulb and a 50/50 bulb to give yourself a nice happy medium between the two lighting levels. What about natural sunlight? The problem with natural sunlight is that you have no control over it. It varies from day to day due to the weather and year round as the seasons change. Some people have found success using natural sunlight with their tanks, however most have reported that their tank suffered from massive algae problems until the tank was moved to a new location where it no longer received natural sunlight. For your first planted tank, natural sunlight is something that I highly recommend you avoid. Now that you have your lighting fixture and bulbs all picked out, you’ll want to set them up on a timer so that they are on between 8 and 12 hours a day. The timer is important to ensure that your plants are getting the proper amount of light every day. You’re going to need one for when you go on vacation anyway, so you might as well get it now and save yourself the hassle. You’ll need to experiment to determine the best length of time for the lights to be one, as each tank is a little different. Make sure not to go over 12 hours though, as plants need time to rest too. All I need is a bottle of fertilizer and maybe some plant tabs and I’m good to go, right? Unfortunately this is not the case. The sad thing is that most of the time, you’re not even going to find all of the fertilizers that you need stocked at the LFS. If you ask, they may be willing to order them for you. There are two basic types of nutrients that your plants need, Macro Nutrients and Trace Nutrients (Micro Nutrients). The Macro Nutrients are Nitrates, Phosphates, Potassium, and Carbon. Carbon is usually supplied through CO2 injection and will be discussed in more detail in the next section. Trace Nutrients are numerous but only needed in small amounts. Here is the good news for those of you that have decided to stick to a Low Light aquarium. You may not have to worry about dosing any fertilizers at all. The majority of the trace nutrients your plants need are already available in your tap water. Your fish will provide the Nitrates and their fish food will supply the Phosphates. The most your are likely to need is a good comprehensive Trace mix to provide any Trace Nutrients your tap water may be missing and some Potassium. Follow the dosing instructions for dosing the Trace mix along with 10ppm of Potassium once or twice a week and you should be set. You should test your Nitrate and Phosphate periodically to ensure that your fish and fish food are providing adequate amounts of Nitrate and Phosphate for you plants. If you find that either is close to zero, it’s time to start dosing that nutrient as well. On the other hand, if you have chosen to set up a High Light aquarium, this is where the High Maintenance part comes into play. With High Light you are basically overdriving your plants and causing them to grow rapidly. As a result they will consume more nutrients than is readily available in the aquarium. When they run out of one or more of the nutrients the plants stop growing and algae takes over. To avoid this you need to dose fertilizers. If you don’t already own liquid reagent test kits for Nitrate and Phosphate, now is the time to buy them. These will tell you how much and how often you need to dose Nitrate and Phosphate. Without the test kits balancing the nutrients in your tank will be an algae nightmare. Nitrates and Phosphates should be dosed at a ratio of 10-20ppm Nitrate to 1ppm Phosphate. Unfortunately the only test kits for Potassium are very expensive and aren’t readily available, but luckily this is one nutrient that it is extremely difficult to overdose. As with a Low Light tank 10ppm Potassium once or twice a week is a good level to begin dosing at. If your plants start to show signs of Potassium Deficiency, then you will need to increase the amount that you are dosing. As with the Low Light tank you should dose traces according to the instructions on the bottle. If your plants start to show deficiencies for any of the trace nutrients you can increase the amount you are dosing. Here’s a side note about Iron. It is a trace nutrient and there should be plenty of it in your Trace mix, so in most circumstances there is no need to dose it separately. Just leave that bottle of Iron Fertilizer on the shelf. Finally, back to plant tabs. As mentioned in the section about substrates, when you are using a substrate that isn’t rich in nutrients you will want to amend the substrate with plant tabs. In addition, whether you are dealing with High or Low light you will find that certain plants are heavy root feeders. These plants will benefit greatly from having a root tab placed directly beneath the plant especially when moving or first introducing the plant to your tank. Some examples of heavy root feeders are Swords and Crypts. Like most things, everybody has their favorite brand of fertilizer. Overall I have heard the most consistently good feedback about the Seachem line of fertilizers. For smaller tanks these are convenient and relatively inexpensive. You would be looking at the following products: Flourish Comprehensive (Traces), Flourish Nitrogen (Nitrates), Flourish Phosphorus (Phosphates), and Flourish Potassium (Potassium). Unfortunately in larger tanks these become cost prohibitive. At this point, you will want to consider dry dosing your fertilizers. Most of the items that you would need to dose are available in products like Epsom Salts, NoSalt, and Fleet Enema. If you don’t feel like trying to figure out what all the products are that you would need to buy and tracking them down, you can also visit http://www.gregwatson.com. Greg Watson sells all the dry fertilizers that you would need at very reasonable prices. From his site you would need to order: CSM + B Plantex (Traces), KNO3 (Nitrates and some Potassium), KH2PO4 (Phosphates), and K2SO4 (Potassium). You may have heard of PMDD (Poor Man’s Dosing Drops). PMDD is an all in one fertilizer (Traces and Macros) made from dry fertilizers that can be added to the tank in one single dose. PMDD has been a popular method of dosing fertilizers for many years, however, it has recently passed out of favor and is being replaced by EI (Estimative Index). The reason the PMDD has passed out of favor is that since all the fertilizers are mixed into a single solution, if you find that you are low on one nutrient you have to dose all nutrients. This can lead to severe imbalances in other nutrients and surprise, algae. With EI you determine the maximum uptake rate of the plants and then dose to ensure that no deficiencies can occur. No test kit required. At the end of the week you do a massive water change, 50% or more, to reset your water parameters and minimize the possibility of a nutrient imbalance. Tom Barr suggests that only deficiencies cause algae and not excesses, which is why you should be able to safely dose to the maximum uptake rate of you plants. You can read more about this at http://www.barrreport.com/forums/showthread.php?t=1. Another method that a lot of people are using is to dose to certain targets and ratios. These are the same targets listed earlier in this article. In a way, it’s a hybrid of the EI with some testing thrown in for reassurance. It requires a bit of upfront testing, especially if you don’t trust that you’ve done the math right, but only occasional testing later on as you get the feel for your tank and how it uses nutrients. As with EI, a large water change at the end of the week is still a very good idea. The best thing about this method and EI is that each nutrient is dosed separately. There is no problem if you suddenly find that your tank needs more Potassium, you just increase you Potassium dosing and leave everything else as is. In Low Light setups the ambient level of CO2, a form of carbon, is sufficient for your plants needs. This isn’t to say that your plants wouldn’t benefit from CO2 injection, but rather that it isn’t mandatory. When you choose not to inject CO2, increased surface agitation will help maintain the ambient CO2 levels. In High Light setups CO2 injection becomes a necessity. Without CO2 injection you will constantly be battling algae. Remember that carbon is a macro nutrient and needs to be maintained in balance with the other nutrients in the tank to prevent algae. In CO2 injected tanks it is necessary to minimize surface agitation. This includes getting rid of that Bio Wheel if you have one and making sure that your water level doesn’t fall so low that water returning from the filter starts splashing. Too much surface agitation will cause the CO2 to be gassed out making it difficult to maintain desired CO2 levels. To measure CO2 levels you will need pH and KH test kits. Without these it will be very difficult to determine how well your CO2 system is working and to troubleshoot any problems. If you don’t have them, now is the time to buy them. CO2 is calculated using the following formula: CO2 (in PPM) = 3 * dKH * 10^( 7-pH ). Ambient levels of CO2 are approximately 3ppm. If you measure the CO2 levels in your tap water after aerating it or letting it sit for 24hrs and you get a number significantly higher than 3ppm, this means that there is something buffering your water other than KH, and the CO2 formula will not work for your situation. If this is the case, visit http://www.thekrib.com/Plants/CO2/co2-meter.html. That article describes a method for calculating CO2 in a tank when the standard formula is rendered invalid by buffers other than KH. Depending on whom you talk to, you will receive different recommendations on what CO2 level you should be aiming for. My recommendation would be to aim for between 30-35ppm of CO2. Some people claim that CO2 levels this high can be dangerous to fish, however I have heard from many people that are running their CO2 levels this high or even higher with no ill effects to the fish. A more conservative recommendation would be to run your CO2 between 20-25ppm. One thing that you should keep in mind is that CO2 does not displace oxygen, so you can achieve high levels of both. Problems will occur for fish when there isn’t enough oxygen in the tank at night when both plants and fish use the oxygen. If this happens you will wake up in the morning to a tank full of fish gasping at the surface of the water. This is most likely to occur in a tank that is heavily stocked with both fish and plants. There are several things that you can do to alleviate this situation, one of the easiest is to place an air stone in the tank, and turn it on at night when the lights are off. Most people will find that their plants produce more than enough oxygen during the day to keep both the plants and fish happy at night. There are two main methods recommended for CO2 injection, DIY CO2 and Pressurized CO2. DIY CO2 involves mixing Yeast, Sugar, and water together to produce CO2. It is relative easy to setup and fairly inexpensive. The biggest drawback is that you have to change the CO2 mixture every few weeks. It can also be difficult to maintain consistent CO2 levels with DIY CO2, especially during the winter when cooler temperatures slow down yeast production. For a Pressurized CO2 setup you would need a CO2 cylinder and regulator. There is a lot of optional equipment that you can buy to further automate the system. Pressurized CO2 is much easier to maintain and get consistent CO2 levels. The biggest drawback is the initial expense of the system. Long term the Pressurized CO2 setup will be less expensive and more convenient than the DIY setup. For most people the size of the tank is the driving factor when determining whether to use DIY CO2 or Pressurized CO2. For small tanks under 30 gallons, DIY CO2 inexpensive and easy. With tanks between 30 gallons and 55 gallons it becomes more difficult to get sufficient levels of CO2 with DIY CO2 and Pressurized CO2 is the preferred method if you can afford it. Anything over 55 gallons should really use Pressurized CO2, since DIY CO2 would be nearly impossible. Another factor is the number of tanks that need CO2 injection. It is possible to buy a relatively inexpensive manifold which will allow you to inject CO2 into multiple tanks using a single CO2 cylinder and regulator. DIY CO2 is very simple to setup and fairly inexpensive as well. For an excellent article with instructions on how to build DIY CO2 I would recommend visiting http://www.qsl.net/w2wdx/aquaria/diyco2.html#6. This article provide nearly all the information you could possibly want to know about setting up this type of system, and has some very good diagrams to help you build your own. There are just a few things that I would add to the information provided in the article. To make it easier to maintain consistent levels of CO2 in your tank, run at least two bottles. Then you can alternate the week that you change the mixture in the bottles. This way one bottle will always be producing well when the other bottle is just getting started. With smaller tanks this means using smaller bottles for the CO2 mixture so that you can still run multiple bottles. I definitely recommend the Fourmost Bulkhead Fittings mentioned in this article for connecting the airline tubing to the bottles. They work really well, look nice, and are fairly inexpensive. Just make sure to purchase the large fittings, as the one pictured in the article are actually too small for standard airline tubing. Also it’s a very good idea to buy a check valve and place it between the bottle and the tank. This will prevent the tank water from back siphoning into the bottle and means that it takes less time for the system to repressurize when changing the CO2 mixture. Finally I would recommend using one 2 liter bottle per 10 gallons. The article only recommends one 2 liter bottle per 30 gallons, but the article is only trying to achieve 15ppm CO2. To achieve the higher levels that most people recommend you will need more bottles. For a pressurized system there are two main things that you need a regulator with needle valve and a CO2 cylinder. The CO2 cylinder usually needs to be purchased locally, but you can order everything else online. What really makes these setups expensive, are all the extras that you can buy. A solenoid valve allows the system to be automated by turning off the CO2 flow when it looses power. You can use the solenoid valve with a simple timer which allows you to shut off the CO2 at night when plants don’t need it. For even more control you can use the solenoid valve with a pH controller, which will maintain the CO2 levels using a target pH range to turn the solenoid valve off and back on. In addition to a source of CO2 you will need a method diffuse the CO2, dissolve the CO2 into the tank water. There are also two main types of diffusion, passive diffusion and powered diffusion. Passive diffusion includes all methods that simply prolong CO2 contact with the water giving the CO2 more time to dissolve. Methods of Passive diffusion include air stones, bells, and ladders. Powered diffusion actively breaks up the CO2 bubbles into smaller bubbles and uses water flow to dissolve the CO2. Some examples of powered diffusion include feeding the CO2 through the filter, powered reactors, and inline reactors. As you might suspect, powered diffusion is the more efficient form of diffusion and will make it easier to attain higher levels of CO2. Both methods of diffusion can be used with both types of CO2 injection. While you can buy CO2 diffusers, nearly all of the different types of diffusers are great DIY projects as well. There are some other options for adding carbon to your tank that may be available at your LFS. As with many products, some are much more effective than others. Many should be avoided because they are completely ineffective, cause dangerous changes to your water chemistry, or are more expensive than your other alternatives. One of the most commonly available alternative sources for CO2 are fizz tabs. Several manufacturers offer them under a variety of names, but all should be avoided. These tabs will be ineffective at best, and at worst they will raise your CO2 to dangerous levels. They offer little to no control over the amount of CO2 being added. Many manufacturers are starting to offer inexpensive CO2 systems. These systems are just DIY CO2 with a passive diffuser in a pretty package. If you are leery of building your own DIY CO2, they can provide a nice starting place. In most cases you are better off building your own, since it is less expensive and the canister that is supplied with these systems is much too small to generate enough CO2 for most tanks. Another system that is becoming better known is the Carbo Plus. The initial cost of this system is comparable to a pressurize CO2 system, but the ongoing cost of replacement carbon blocks is much more expensive. It uses the carbon block and electric current to break down KH and release CO2, which could result in a PH crash. Due to the dangers to your water chemistry and the cost of the system, I recommend that you avoid it. Finally, there are several liquid CO2 products available. Most of these should be avoided since they are either ineffective or provide CO2 by breaking down KH. The one exception is Flourish Excel. This product works as claimed and can be used alone or in conjunction with CO2 injection. Flourish Excel is especially effective in small tanks were CO2 injection may be impractical, while in large tanks it becomes cost prohibitive. With the information that has been provided in this article, you now have an excellent foundation to start a planted tank. If you decide to give it a try, I think you will find it very rewarding and possibly more addicting than fish. For additional information, I recommend that you check out the following websites and articles, some of which have already been mentioned in this article. http://www.plantgeek.net Many great articles and an extensive library of information about plants. http://www.tropica.com/default.asp An extensive library of information about plants. http://www.aquariaplants.com/index.htm Many great articles on all aspects of keeping a planted aquarium including both algae and nutrient deficiencies. http://www.csd.net/~cgadd/aqua/articles.htm Many great articles including both algae and nutrient deficiencies, and a calculator for fertilizers and CO2. http://article.dphnet.com/cat-04/substrates.shtml Detailed information about substrates and a link to analysis of a variety of popular substrates. http://woo.gotdns.com/Aquarium/Lighting.htm New lighting level theory. http://www.qsl.net/w2wdx/aquaria/diyco2.html Everything you ever wanted to know about DIY CO2, including plans to build your own DIY CO2 system. http://www.gwapa.org/articles/inline_co2_reactor/ Plans for an inline CO2 reactor. http://showcase.aquatic-gardeners.org/2005.cgi Their annual aquascaping contest is excellent inspiration for aquascaping your own tank. In addition to these resources, I also find that it is very beneficial to join an aquarium forum that has a forum especially for planted tanks. These are great, because they allow you to connect with others that share the same interest and can provide you with additional information when something is unclear or you are having difficulty trouble shooting a problem.